The all new MYDO Luck Shot range features #3 at 2 Ounces – for casting and jigging medium to deep waters. It takes a 5 to 7 inch paddle tail/jerkbait/whatever plastic that comes to life when stuck onto the MYDO Luck Shot # 3, an adaptation of the incredibly successful MYDO Bait Swimmer principles, designs and patents. Cast, troll, jig or drift these versatile lures and work more of the water column as the weight of the MYDO Luck Shot gets you there and back without fuss. The weedless design gets you in and out of structure and under the noses of ambush predator fish. These heavyweights are meant for saltwater deployment and are suitably armed with 8/0 Mustad O’Shaugnessy or Kendall Round single hooks. Strong enough for yellowfin anythings and amberjackers! We tested the internal wire rigging of the MYDO heads to 60kg’s! Imagine all that drag! Should get ’em up! 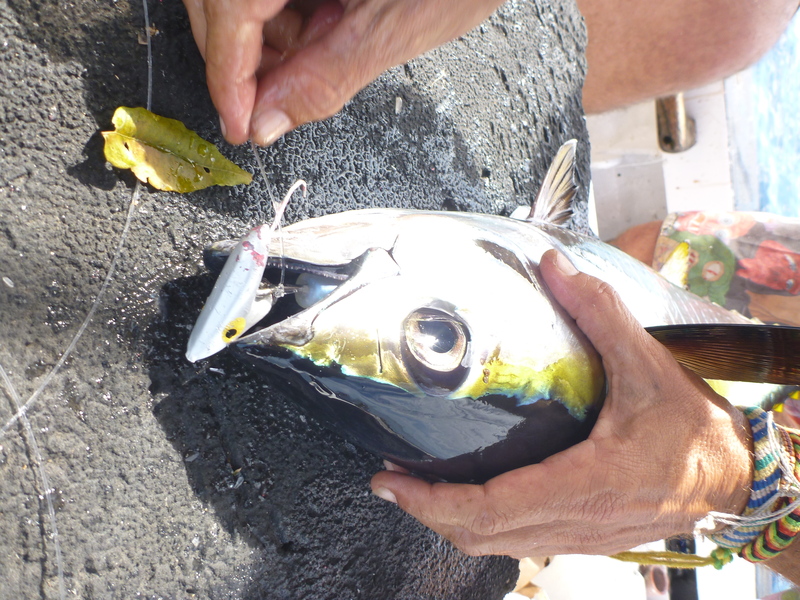 This bait sized yellowfin tuna caught up to the Mydo Luck Shot # 3 with a 7 inch plastic running at 12 knots! The lure just sits tight in the wake and swims perfectly straight with a realistic swimming action. The huge single hook rigged on this Mydo Luck Shot made sure this fish was rigged catalina style within seconds of him taking the lure. Notice how deep down he swallowed the bait – the big hook once again making for minimal damage and easy fast hook retrieval. On the boat, troll this lure as fast as you like, Kona speed is no problem, provided you have the plastic on straight.